We can find many lists of what to bring backpacking, but what are the backpacking essentials? Thankfully, a list of essentials, simply known as the Ten Essentials, exists. This list was created by The Mountaineers, a hiking and mountain climbing club, back in the 1930’s. This list has been the staple list for outdoor activities ever since. Having proper navigation helps prevent you from getting lost. A map and a compass are the two main items in this system. However, having a map and a compass doesn’t mean anything if you don’t know how to use them. A GPS can be used in addition to these items, but it shouldn’t be relied on 100% because it can run out of batteries or have difficultly working depending on your location. Sunglasses, sunscreen, a hat and clothes that provide adequate coverage are important. Sunglasses help you to see better when it’s bright outside, especially if backpacking in snow. The other items prevent sun burn, as well as help keep you cool. Insulation usually takes the form of extra clothing. Extra clothing doesn’t have to be much and what they should be will vary depending on where you are backpacking and the season. Having extra clothing ensures you are properly dressed for whatever conditions you might encounter. Light is very important. You don’t want to unexpectedly find yourself in a situation where it’s dark and you don’t have any light. It’s uncomfortable and dangerous. We find that a headlamp (which can be found cheaply at Wal-Mart) is the most useful because it provides hands-free light. However, we always carry a backup flashlight. You can buy a preassembled kit or build your own. Either way first aid supplies are a must. For more information on backpacking first aid kits, visit our page about them. Matches should be water-proof or packed in a water-proof container. Be sure to pick out strong, reliable matches. Avoid bringing a matchbook (as these can be flimsy) or matches that are old. Firestarter is another handy item you can bring with you. Make sure you have the proper tools to make repairs on equipment such as your stove, tent, etc. Additionally, a multi-purpose tool with a knife, screw driver, can opener, saw, scissors, etc. comes in very handy. Having food on a backpacking trip, even if it is just a day hike, is vital. As your body burns extra calories, you need fuel to keep it going. In addition to the food you plan on using, bring extra non-perishable, no-cook food that has lots of calories in the event your trip is longer than expected. For more information, visit our backpacking food page. If you’re backpacking for an extended period, you’ll already have shelter taken care of. However, even if you’re only going on a day hike, some sort of shelter is a smart piece of equipment to have in the event of a sudden change in weather, getting lost or hurt. A lightweight tarp is perfect for this piece of equipment. If you want to learn more about tarps, visit our backpacking tarps page. You should follow this list of backpacking essentials whenever you go out into the backcountry. 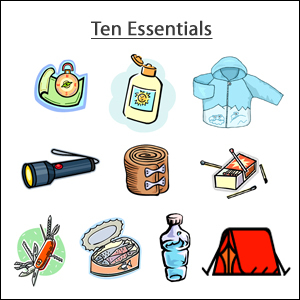 While there are other items you need to bring backpacking and you certainly don’t always use everything from this list, it is important to remember the philosophy behind this list is that it has what you need to take care of yourself in an emergency. If you’re interested in learning about gear beyond the backpacking essentials, you can visit our backpacking equipment page or our backpacking checklist.